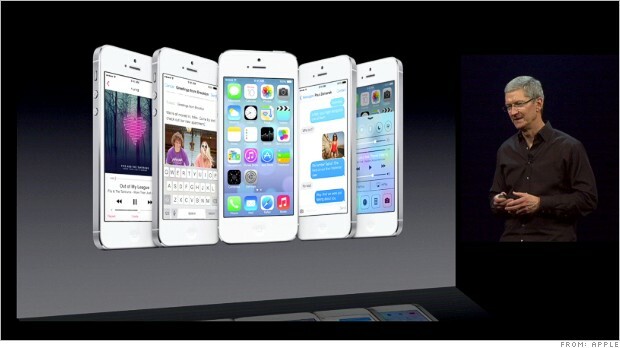 Today it was announced that there would be a new look for iOS7 and Apple was not kidding nor did it disappoint. There are major changes to the look and feel of mobile devices which has been spearheaded by design chief Jony Ive. Gone are the days of “real-world” looking apps and instead they have been replaced it with a much nicer and crisp design. Whilst saying that they were also looking over their shoulder, well aware that the WWDC was close by and wondering what Apple will pull out of the bag. I must admit my expectations were rather low. I was disappointed with the iPhone 5 and really don’t think it offers anything more than the iPhone 4S but it would probably have been worth the upgrade if you had the 4. iOS7 has not disappointed me though, it’s pleasantly surprised me. I like some of the new features, in particular I think the iCloud keychain and password generator is a real nice little addition. It will help me a lot and it’s free so it means I don’t have to spend the money on 1Password. There is of course though, in traditional Apple form, some features that should have always been on the iPhone that never were and are now being dressed up as some super cool new element. I am of course talking about the ability to share pictures, videos and contacts via AirPlay. Oh wow thanks Apple, only most other phones have had that ability for years with Bluetooth functionality and it isn’t restricted to just an iPhone. I suppose it’s a step in the right way though. Some other points that has made me smile include the increased functionality of the FindMyiPhone app, the efficiency of the control center and the updated Safari. If you lose your phone then and you wipe it then it now disables the phone completely. The only way around this is if you have your Apple credentials – sweet move! The control center looks a lot easier and can be accessed with one swipe, giving you control of many of the quick and important regular tasks you do with your phone such as playing music to accessing wifi spots. Not really sure what to make of the iRadio. It basically seems to rival Pandora and links closely with your iTunes account, trying to understand your tastes in music. Apple has had mixed success when it comes to trying new things with music content (other than iTunes itself) so we shall see. Again, it’s free though so it’s worth checking out. It leaves me wondering though, why would anybody want to purchase or download music if they can just stream it for free? Could it challenge iTunes itself? All in all I think Apple have come up well with it’s latest iteration of its mobile Operating System. It’s available in the Fall (autumn for our UK readers) and it’s actually still going to be available for the iPhone 4 so as long as my phone lasts out that long, I will be downloading it the day it comes out to try out the new features. Are you pleased with the latest updates? Has it changed your opinion on whether to stay with Apple products or not? Let us know. The Apple iPhone (4S and 5) appears to be so good that it has stumped law enforcement agencies. The ATF have apparently requested the assistance of the group in Cupertino to get past the encryption as they can’t. There’s one small catch…Apple put you on a waiting list! That’s right, according to the CNET article Apple are so deluged by the amount of requests that there is a 7 week wait and that’s if you’re lucky! One request reportedly took 4 months to complete. This opens up the wider issue of privacy and in the case of America, 4th Amendment rights. Personally what I would like to find out is why and how Apple Inc can manage to decrypt your data and make it available to officers. Did they build a backdoor into their encryption? If this is the case then surely they will lose a lot of trust within the technology community? If that’s not the case and they managed to work around it then how secure is our data in the first place? By now you probably are already aware that I will side with the privacy advocates. It’s simply not a question of “well I have nothing to hide so why do I care”. The underlying point is why should I have to justify my actions unless there is valid cause? If law enforcement suspect me of a crime then go ahead and use the proper legal avenues to bring about any action. Our founding principles both in the UK and the US is innocent until proven guilty. That principle has managed to work well for hundreds of years, I don’t see why that would change now.